BORLA® has developed a revolutionary new exhaust technology that enables our engineers to deliver unprecedented vehicle-specific control over the acoustical note of an exhaust throughout the RPM range, while retaining 100% of the power-adding capabilities of BORLA’s patented multicore design. Called ATAK™ (Acoustically-Tuned Applied Kinetics), this new technology produces the highest available dB (decibel) levels in the BORLA street-legal lineup, and is designed for high-performance purists who prefer exhaust notes over their stereos. The focus of ATAK™ is to pump the volume while retaining clarity of sound, avoiding distortion typically found in louder exhausts. With ATAK™, the sound output is tuned like a graphic equalizer to shape and focus sound waves for optimum high-volume output. The development of each ATAK™ system begins with extensive study of each vehicle’s acoustical properties. 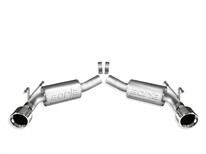 The technology is based on custom-tuned attributes of the internal muffler cores, which are calibrated on a vehicle-by-vehicle basis to deliver the most desirable sound. A complete technology overview with extensive video footage of launch, drive-by, and in-cabin sounds with a 2010 Camaro SS can be viewed at www.youtube.com/borla. “The distance from the exhaust manifold to the rear bumper, the shape of the underbody shielding, the amount of ground clearance, all these factors affect the sound, and they’re different on each vehicle. With ATAK™ we take all this into account, and the result will blow you away,” says company Sales Marketing Manager, David Borla. Several BORLA ATAK™ systems are currently available. For the 2010 6.2L V8 Camaro there is a Cat-Back™ systems (PN 140356 and 140378) and Rear Section (PN 11788) for models without the “Ground Effects” option, and a rear section (PN 11794) designed to complement the Ground Effects kit. NOTE: YouTube/Borla ATAK Video sound comparisons were done with Cat-back© systems only. Your results may vary depending on additional equipment. REAR SECTIONS MAINTAIN STOCK FRONT MUFFLER SO THE FULL EFFECT OF THE ATAK SOUND IS NOT REALIZED, BUT STILL LOUDER THAN THE S-TYPE. Like all BORLA exhaust products, each system is handmade in the USA by master craftspeople and features premium 300-Series high-quality austenitic stainless steel construction, ultra-smooth mandrel bent piping, mirror-polished tips, and a Million-Mile Warranty.